Abbot Thomas had been in correspondence with the Director of the Museums asking for the stones over the years. Al Wilsey came to Vina to pursue the possibility of the Stones coming to New Clairvaux. It was through his direct influence and help that the Stones were awarded to the abbey and transferred here. The Board of Trustees of the Museums awards the stones to the Abbey. The legal requirements are studies and processed. The Transfer Agreement is signed by the Director and Abbot. The Abbey has 10 yrs to do “something” towards reconstruction. 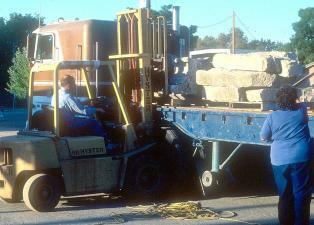 On September 13th, first load of stones leave San Francisco for Vina. 6 loads come at this time (truck and trailer).